Trying to work through my giant back log of games at the moment, I recently went through Syndicate which was loads of fun but the premise of giant syndicates ruling the world backed up by cybernetically enhanced agents didn't really earn itself a place on this blog (though being able to hack into enemies implants to cause them to commit suicide was fantastic!). 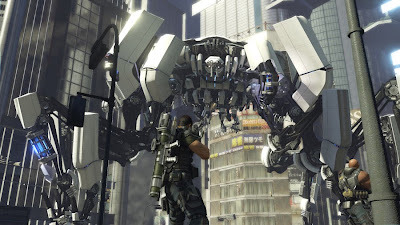 Binary Domain was the next game on my list to play, this one justifies its inclusion here, dealing as it does with the concept of robots becoming self aware Terminator style. 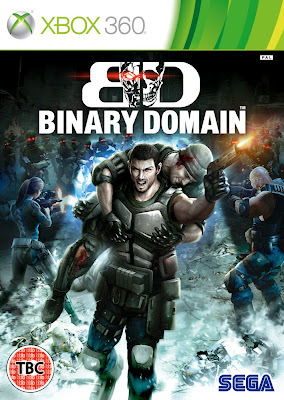 Binary Domain takes place in the early 21st century on an Earth were rising sea levels have destroyed most the cities of old, new cities were built on top of the flooded ruins, built by robots. During the creation of robots a new Geneva Convention was created which banned the creation of human like robots. An attack on the American based Bergen robotics company by a robot identical in appearance to humans (termed a 'hollow child') leads the authorities to the conclusion it must have been created by the Japanese based Amada robotics company. 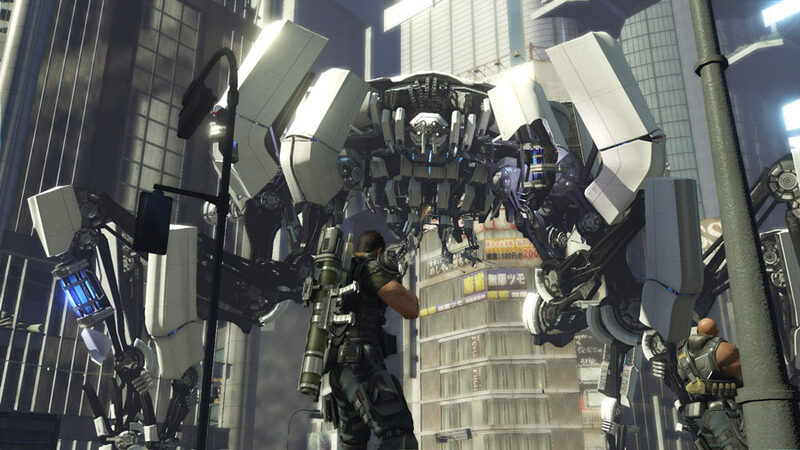 An international 'Rust Crew' (team of soldiers dispatched to deal with any breach of the New Geneva Convention) are sent to Tokyo to investigate Amada's HQ and bring in Amada himself for questioning. You play as an American; Dan Marshall who is joined by fellow American 'Big Bo' as well as English, Asian and French soldiers. This is a third person cover based shooter that reminded me a lot of Vanquish due to the robotic enemies. Every single enemy in the game from lowly robot soldiers to the hulking great bosses can be shot to pieces, armour, limbs and heads blown off. 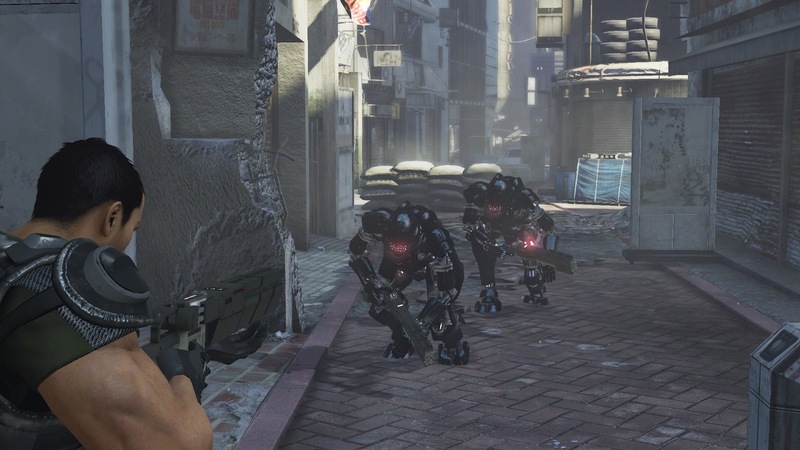 Shooting the legs results in enemies crawling 'Terminator' style towards you in pieces, shooting the head off confuses the robots and makes them turn on their own side, while you can disarm the Scrap Heads by blasting off their arms. Robots get air dropped by huge flying gunships, as well as carried in individually by flying bots. For the most part these robots are humanoid in appearance, though there are a huge variety of enemies such as ones that resemble apes, spiders, and more. Bosses are gigantic and a lot of fun to battle, from a giant near unstoppable gorilla like one to an Avatar inspired mech. All take visible damage as you battle them, combat is a lot of fun. Points earned from destroying your foes can be used to equip power ups, while each of your team can have a variety of options upgraded on their weapons. There are a lot of characters you get to have in your squad each with different skills. Based on how you treat them you gain or loose their trust, so if you keep shooting them they will grow to hate you (they do have the irritating desire to suddenly run in front of your gun and then blame you when they are hit). You can talk to them using a microphone but that is a bit unreliable, is far quicker just to communicate using the controller. You can give them basic commands but to be honest I never bothered and was no worse off for that. The plot was ok, plenty of lengthy cut scenes that were quite cool at times and quite violent. 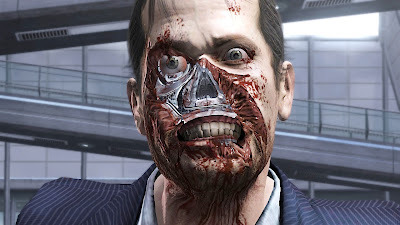 The initial attack on the American robotics company saw someone rip off their face in grim detail, later on a discovered Hollow Child has a cigar stubbed out on its eye ball, quite grim stuff, especially when Hollow Children are programmed not to know they are robots and so react as if human. Your team mates are not bad, even the irritating ones I came to like by the end of the game. Plot twists are many but there was nothing that blew my mind. 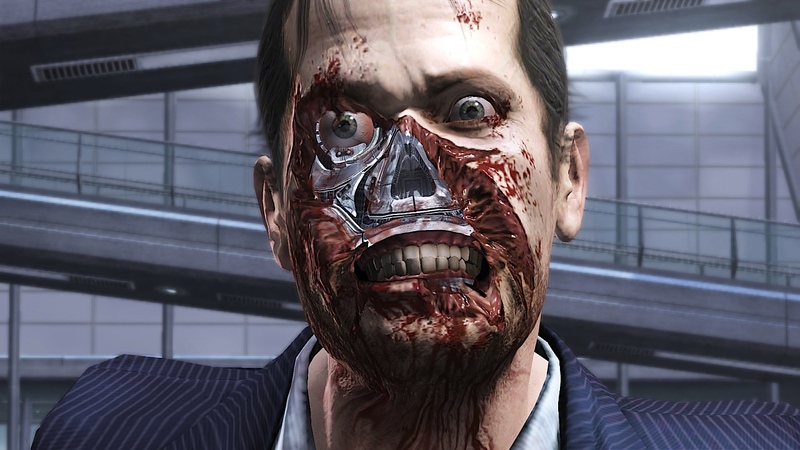 Binary Domain is split into 3 distinct sections. The initial infiltration of lower Tokyo, next the fight through New Tokyo, finally the assault on the Amada company HQ. The game does do a decent shading of the issue of if artificial life has a right to exist, not just black and white; well handled including themes of racial persecution. Third person shooting from start to end would be boring but there are lots of one off sections such as a long slide down a watery hill, battles from inside a truck on a long highway, a jet ski chase and lots more. These sections are a welcome diversion from the main game and cool to get to do something that would normally occur in a cut scene. Not so welcome are the walk and talk sections that have you moving at a snails pace. 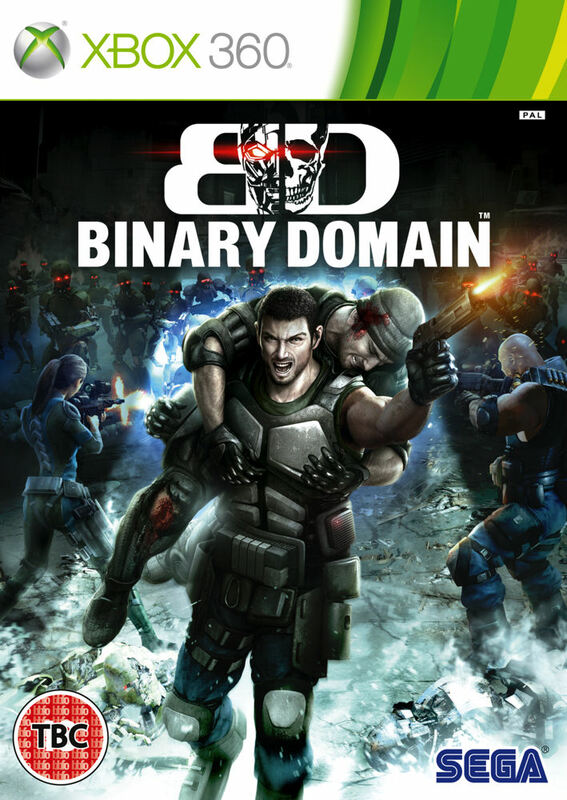 After a shaky start I really enjoyed Binary Domain, played through it in 3 sittings, the characters may be a bit hokey (it is a Sega game after all) but it was a literal blast playing through it and had some great sci-fi b-movie style music that I adored. Is cheap now so there is no excuse to not experience this solid shooter for yourself. As a last comment the game manages to squeeze in robot zombies! Randomly enough just before these appeared I was honestly thinking to myself I had never seen robot zombies before, the game must have read my mind.